Recognised for its commitment and consistent efforts, SkyBus has received many prestigious awards and recognitions. In 2007, Malaysia Airports Berhad (MAB), awarded SkyBus with the Airport Service Quality Award and more recently winning the prestigious Enterprise 50 Awards Programme with a top ten finish and winning the Golden Bull Award 2009 for Outstanding SMEs. 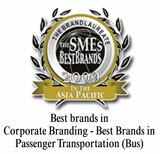 We were also awarded The BrandLaureate 2009 for Best Brands in Corporate Branding – Bus Brands in Passenger Transportation (Bus) award. Our Managing Director / Chief Executive Officer, Chris S.Thiagarajah, himself was top nominee for the Ernst & Young Emerging Entrepreneur of the Year 2009 Malaysia Award.